Isn’t getting away great in the good old summertime? 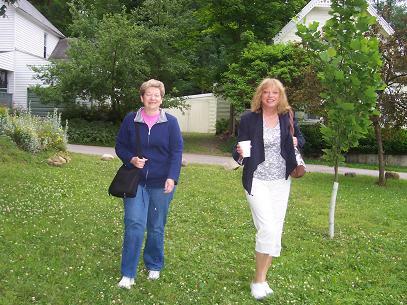 Here’s a photo of me (on the right) and my dear friend, Peggy, on the left that was taken last week. Myself and two pals from college took a girls-only getaway weekend. We certainly didn’t do much except sit on the porch of this B&B and talk and talk and talk. What else do women know how to do, I ask you? Catching up on each other’s lives was so much fun. And the summer weather was absolutely lovely. After the winter we Ohioans had, we were long overdue for some sunshine and warm breezes!